There is no ferry that runs directly between Cancun and Cozumel. The only ferry runs from Playa del Carmen, which is about an hour's drive south of Cancun. The regular ferry run by Winjet costs 135 pesos per adult and 69 pesos per child and takes about 40 minutes to cross, depending on water conditions and passenger load. The new luxury ferry run by Ultramar costs 200 pesos per adult and 130 pesos per child and takes about 20 minutes. The lone car ferry is run by Transcaribe out of the Calica port at Punta Venado, just south of Playa del Carmen, and costs 500 pesos each way. The trip takes about 1 hour and 15 minutes. Most people get from the Cancun Airport to the Cozumel ferry dock via a pre-reserved Airport Transfer. It costs $25.00 per person for a shared shuttle or a private transfer costs between $50.00 to $60.00 depending on the size of your group, if booked through us in advance. There are higher priced shuttles and a bus available at the airport in case you forget to book in advance. You can use the same transportation service to get from your Cancun hotel to the Playa del Carmen ferry pier, at the same prices noted above. Just specify your hotel name instead of your flight information in the booking form. There are also taxis available at your hotel. A taxi to the Playa del Carmen ferry pier costs between $50.00 and $130.00 depending on the size of your group. Just remember to ask the price before you get in, and you may need to negotiate. When coming over to the mainland from Cozumel, the hotel to pier transfer service we offer works in Cozumel as well as from Playa del Carmen. You can also take a taxi. If you'll be renting a car, you'll need to take the vehicle ferry. Family Cars (up to 6m) - $500 Pesos each way. Motorcycles - $200 Pesos each way. Passengers - $68 Pesos each way. Includes ferry and round-trip transportation to the ferry dock. The ferries use the main pier in Cozumel, Muelle Fiscal, at the extension of Av. Lic. Benito Juarez, across from Hard Rock Cafe and Palmeras Restaurant. 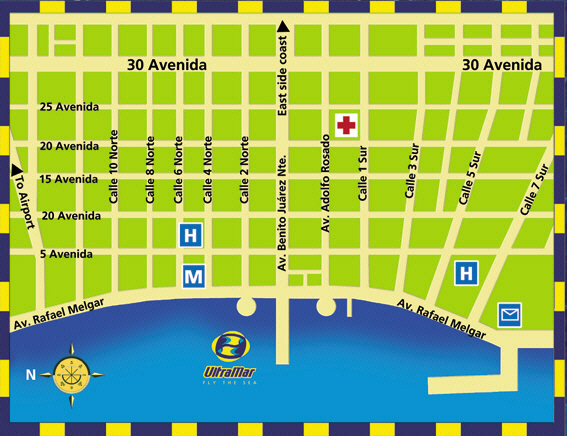 In Playa del Carmen, the ferry pier is located about 1 1/2 blocks from the main square. Very convenient. The car ferry is located at the Calica cruise ship port, just south of Playa del Carmen and docks at the International Pier (Muelle Internacional) in Cozumel, south of town near the La Ceiba hotel. In Playa, there are two street level parking lots and an underground parking garage within a short walk of the ferry pier. Learn More. In Cozumel, street parking near the ferry pier is typically available on the main road, and there is a parking garage at MEGA to the north and at Punta Langosta cruise pier about 5 blocks to the south. Easiest is to take a taxi. 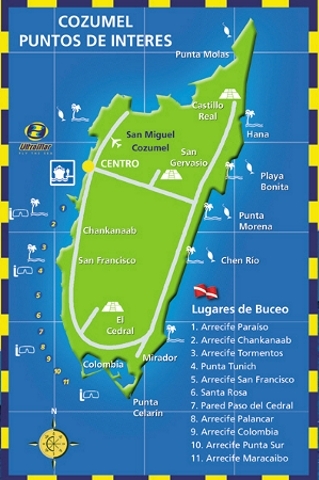 Use the navigation bar at left to browse our massive selection of Cancun Tours & Excursions.